I had to pour a drink before I wrote this review because, well...I needed it. Don't get me wrong, this book was good. This book was also weird. Maybe it's because this is out of my normal genre(s) that I think it's weird. But also maybe not. The story is mainly Carolyn's and Carolyn is a Librarian. She's in charge of a certain catalog and her "brothers and sisters" all have their own as well. Some study medicine, languages, animals, or war. As I read I found that no matter what they studied, they were all pretty crazy. As we follow Carolyn she meets Steve, who is just a regular guy. Then she frames him for murder and you start thinking that maybe Carolyn is a little more than crazy. Maybe she's kind of diabolical. The story unfolds and more characters are introduced. There's a ex-military man who isn't as dumb as he sounds, a couple of lions, and the president. A fictional one, of course. It took me a while to get into this book because I really had no idea what was going on at first. The crazy starts right out of the gate without much segway into what's happening. It isn't until Carolyn starts talking that you understand what is going on. Everyone is searching for Father, but they can't get into the house. 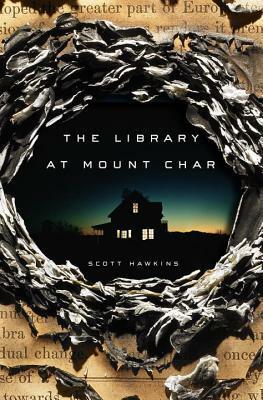 David wants to take charge, but he's a psychopath so Carolyn and a few other Librarians try to form a plan. Nothing works, everything gets messed up, and poor Steve is kind of stuck in the middle of it. As the story progresses I began to like Steve a little bit more and Carolyn a little bit less. Steve is an interesting guy. He wants to do good but doesn't really know how. He doesn't like what Carolyn ends up doing and tries to talk her into something different. Steve cares about others and he can see what has happened because of what happened with the Librarians. By the end of the story I was itching for answers. They are given, by the way. So is Steve's good ending, just not the way I expected it. This book was definitely interesting, if out of my genre. I would definitely recommend it to people who love fantasy/supernatural stories.